Can we use technology in the pursuit of a good life, or are we doomed to having our lives organized and our priorities set by the demands of machines and systems? How can philosophy help us to make technology a servant rather than a master? Technology and the Good Life? uses a careful collective analysis of Albert Borgmann’s controversial and influential ideas as a jumping-off point from which to address questions such as these about the role and significance of technology in our lives. 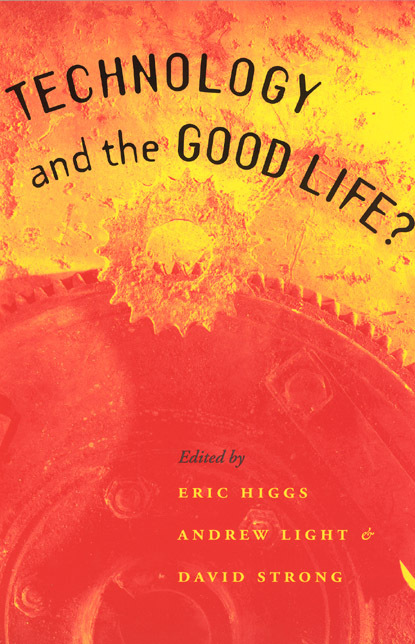 Contributors both sympathetic and critical examine Borgmann’s work, especially his "device paradigm"; apply his theories to new areas such as film, agriculture, design, and ecological restoration; and consider the place of his thought within philosophy and technology studies more generally. Because this collection carefully investigates the issues at the heart of how we can take charge of life with technology, it will be a landmark work not just for philosophers of technology but for students and scholars in the many disciplines concerned with science and technology studies. Introduction: Technology and the Good Life?